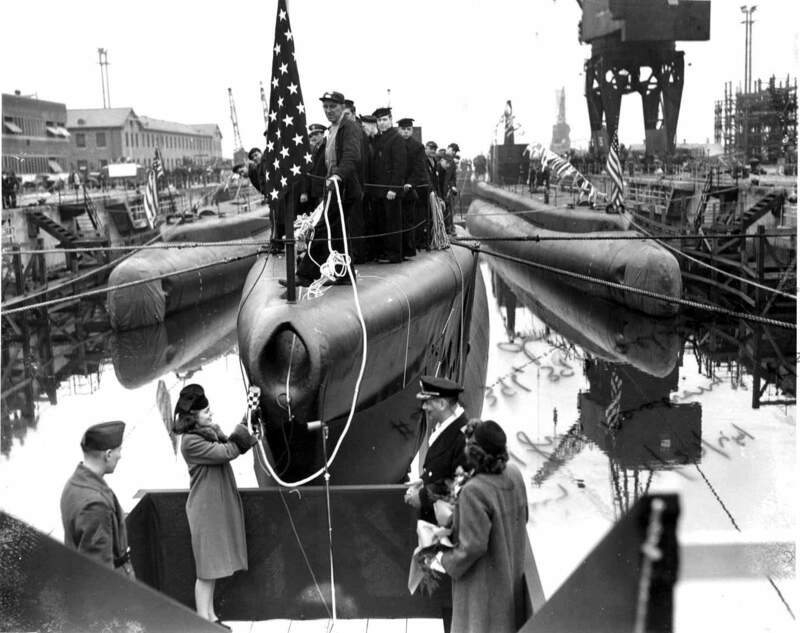 Balao Class Submarine: Laid down, 9 September 1943, at Portsmouth Navy Yard, Kittery, ME. 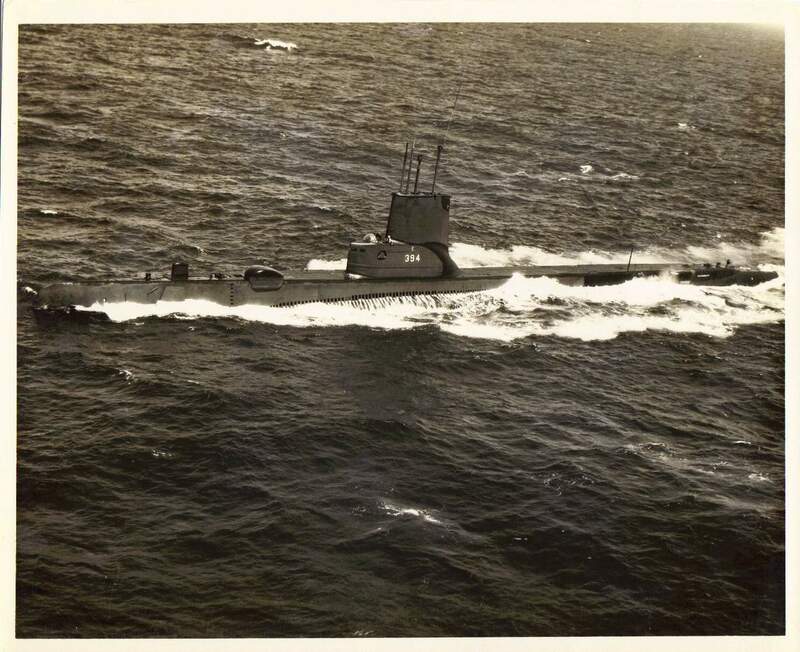 ; Launched, 27 January 1944; Commissioned USS Razorback (SS-394), 3 April 1944; She was one of twelve United States submarines present in Tokyo Bay during the Surrender Ceremony on 2 September 1945. In August 1952, Razorback decommissioned to undergo Guppy IIA modifications. Re-commissioned in January 1954, she underwent shakedown and post overhaul training at New London, CT. On 24 May 1954, Razorback reported for duty at San Diego, CA. 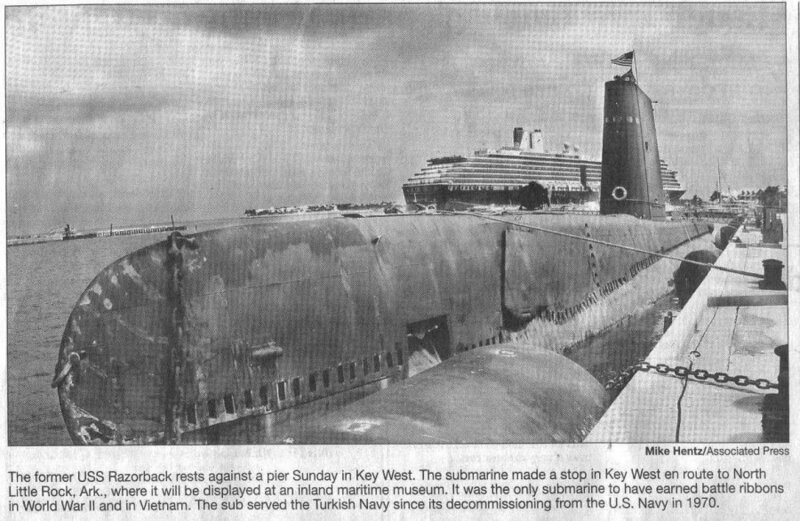 Under terms of the Security Assistance Program, she again Decommissioned on 30 November 1970 at Hunter's Point Naval Shipyard in San Francisco, CA; struck from the Naval Vessel Registry and was transferred (sale) to the Republic of Turkey. 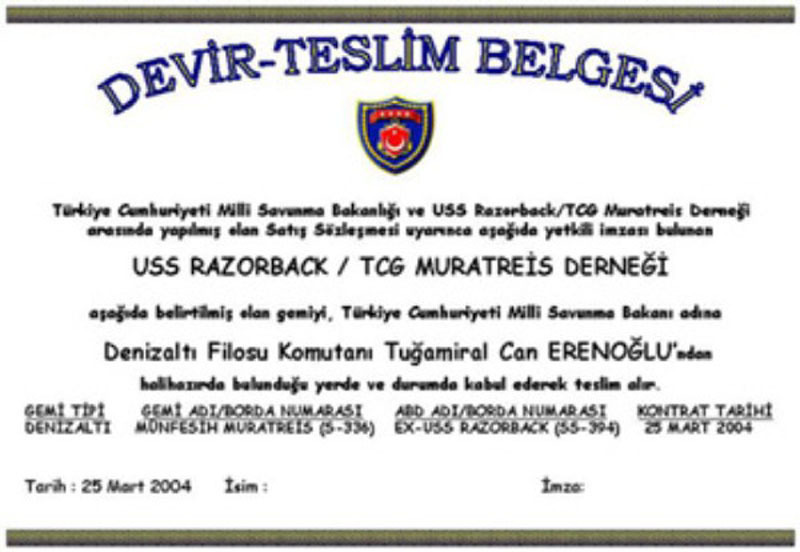 Concurrently, the ex-Razorback was commissioned as TGC Muratreis (S-336) of the Turkish Navy. In 1974, Muratreis (S-336) departed the Golcuk Navy Yard, Turkey under combat conditions as a participant in the "Cyprus Peace Operations". 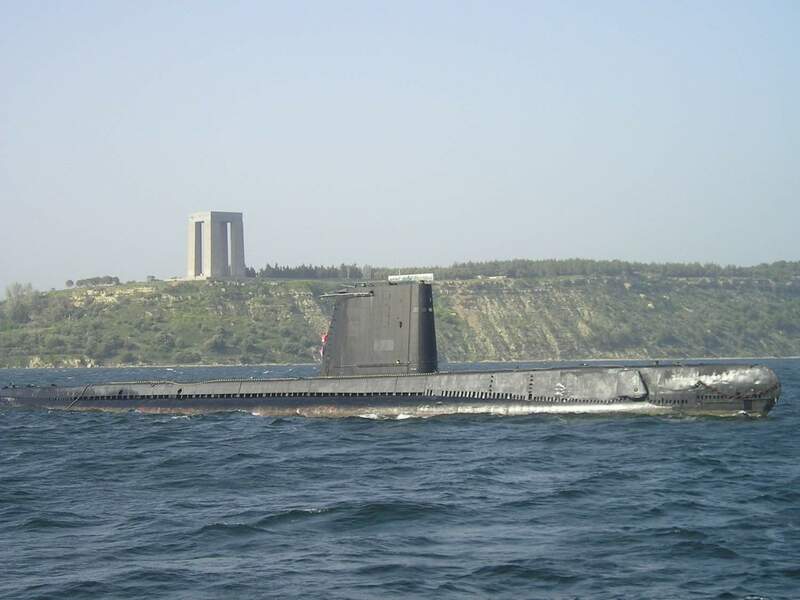 Decommissioned from the Turkish Navy on 8 August 2001, she was laid up at Golcuk awaiting final disposition. 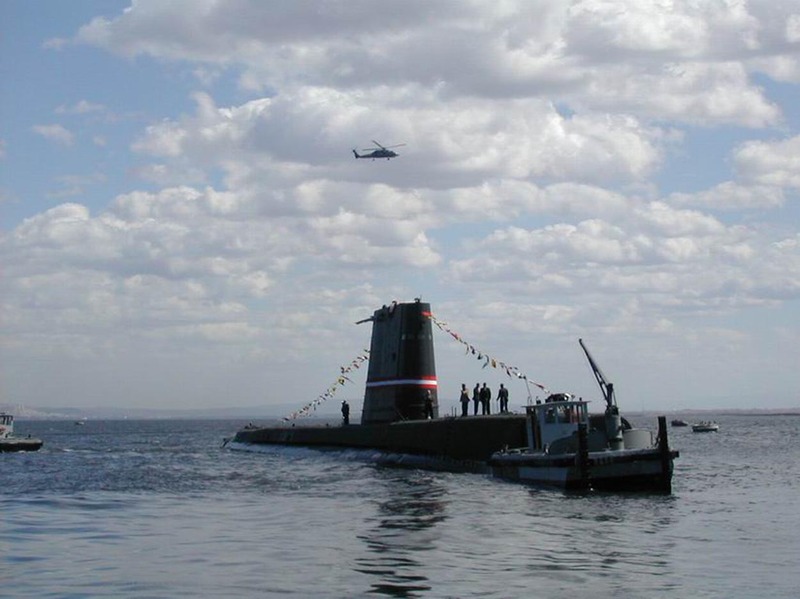 Through the efforts of various veteran and civic organizations, the veteran submarine was purchased from the Turkish Government for the scrap price of $37,500. 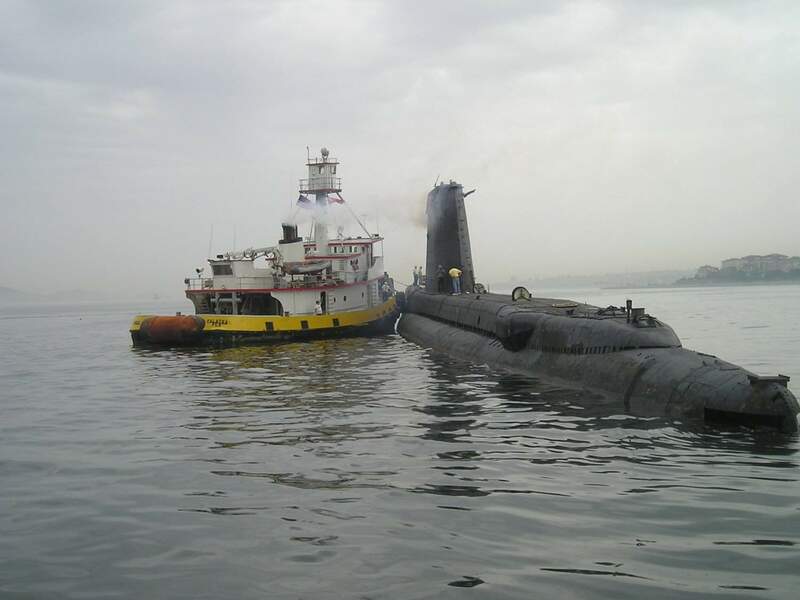 After receiving seaworthiness overhaul at a shipyard in Tuzla, Turkey, the ex-Razorback again put to sea (under tow) on 5 May 2004. 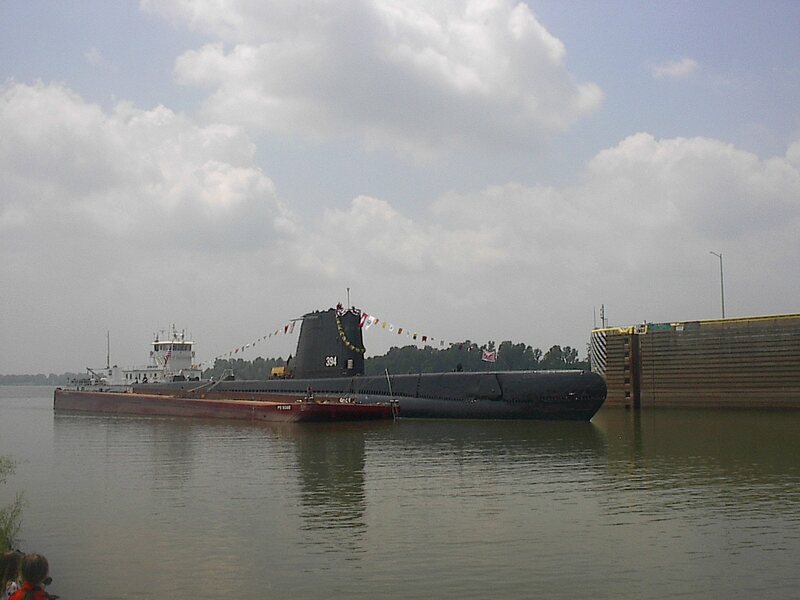 After departure, she made port calls in Gibraltar and Key West, FL and arrived at her final berth at the Arkansas Inland Maritime Museum, North Little Rock, AR on 16 July 2004. Since July 2005, ex-Razorback/ex-Muratreis has been open to the public. 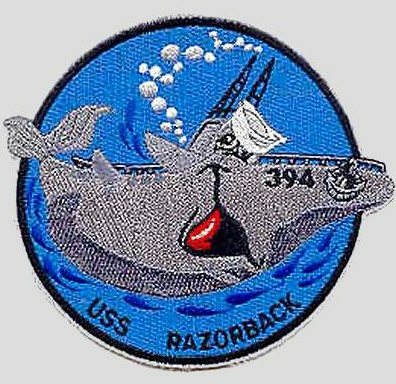 Razorback received five battle stars for World War II service, and four stars for Vietnam service. Researched by CTRC Donald J. Wagner, USN (Ret.) & Yves Hubert for NavSource. Specifications: Displacement, Surfaced 1,526 t., Submerged 2,391 t.; Length 311' 9"; Beam 27' 3"; Draft 15' 3"; Speed, Surfaced 20.25 kts, Submerged 8.75 kts; Cruising Range, 11,000 miles surfaced at 10 kts; Submerged Endurance, 48 hours at 2 kts; Operating Depth, 400 ft; Complement 6 Officers 60 Enlisted; Armament, ten 21" torpedo tubes, six forward, four aft, 24 torpedoes, one 5"/25 deck gun, one single 40mm gun mount, one single 20mm gun mount, two .50 cal. 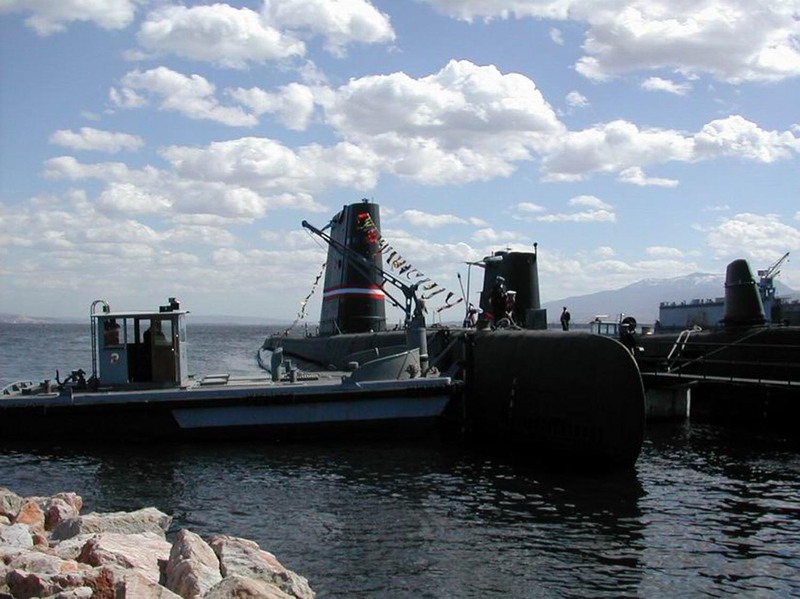 machine guns; Patrol Endurance 75 days; Propulsion, diesel-electric reduction gear, four Fairbanks-Morse diesel engines, 5,400 HP, Fuel Capacity, 116,000 gal., four Elliot Motor Co. electric main motors with 2,740 shp, two 126-cell main storage batteries, two propellers. 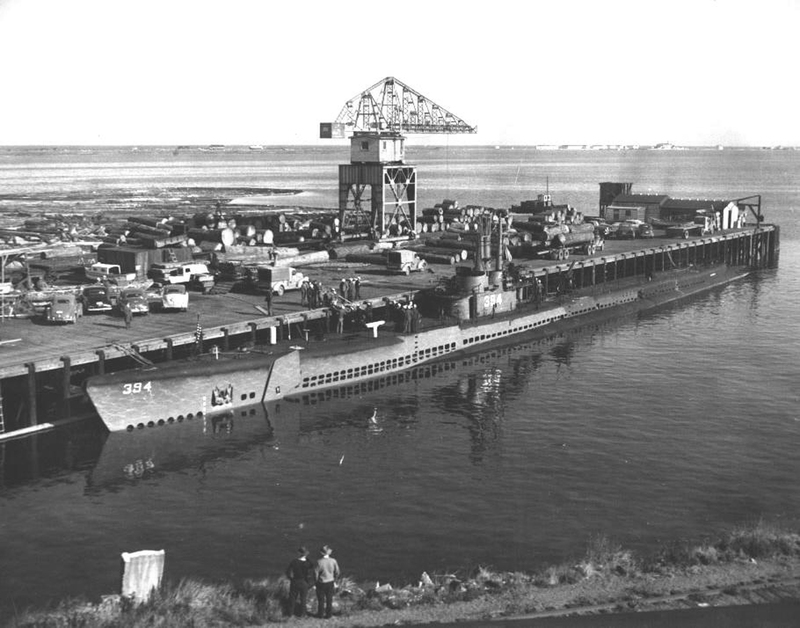 493k Early 1944 photo of the Redfish (SS-395), Ronquil (SS-396) & Razorback (SS-394) under construction and soon to be launched, with prefabricated sections and other building parts for the soon to be constructed Piper (SS-409) & Threadfin (SS-410) in the foreground. 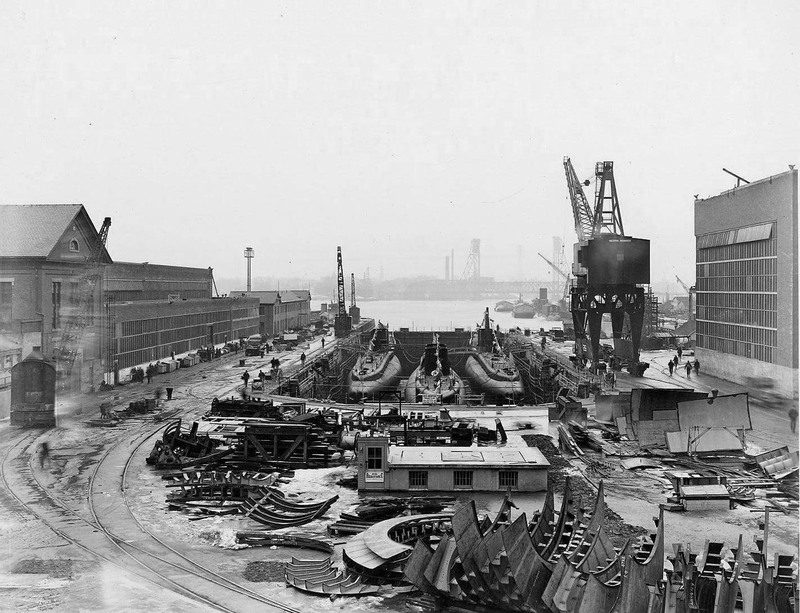 Photo courtesy of John D. Alden, author of The Fleet Submarine in the U.S. Navy: A Design and Construction History. 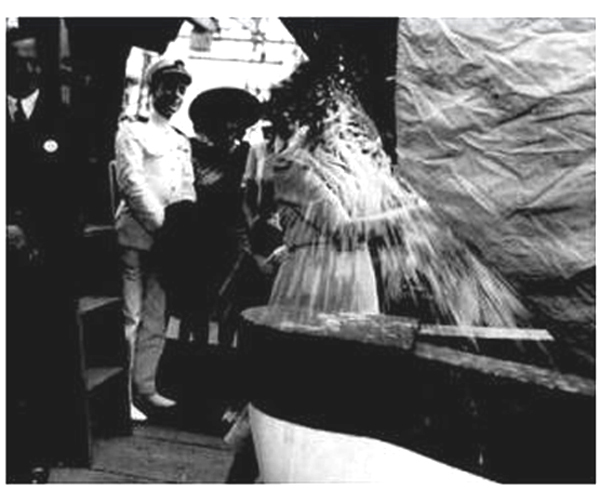 144k Razorback (SS-394) was christened by Mrs. H.F.D. Davis. Photo courtesy of aimm.museum. (Arkansas Inland Maritime Museum at North Little Rock). 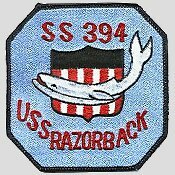 67k Chaplain LT(jg) Paul P. Galliger, USNR, offers up prayers for Razorback's (SS-394) officers and crew. US National Archives Photograph # 221686 donated by R. Hansen. Photo courtesy of aimm.museum. (Arkansas Inland Maritime Museum at North Little Rock). 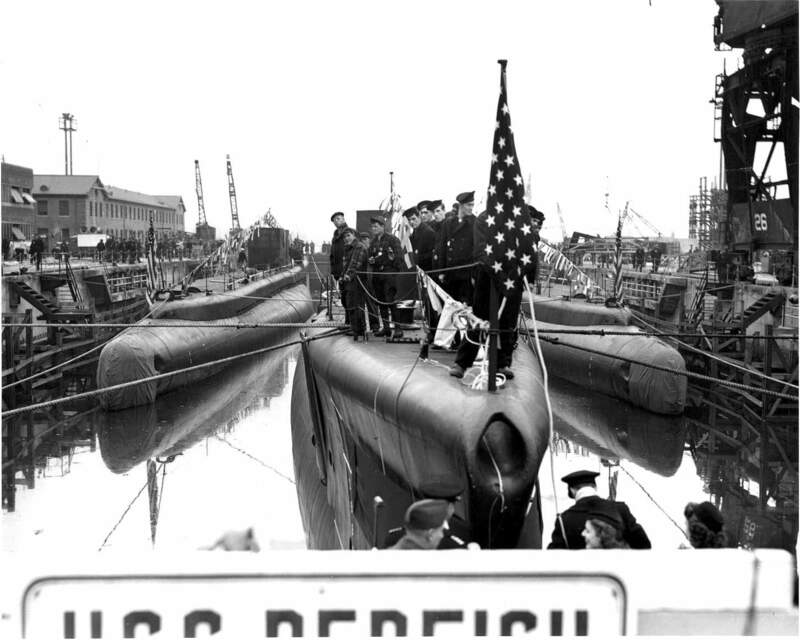 154k Preparing for the Christening ceremony aboard the Redfish (SS-395) at Portsmouth Navy Yard, Kittery, ME., 27 January 1944. 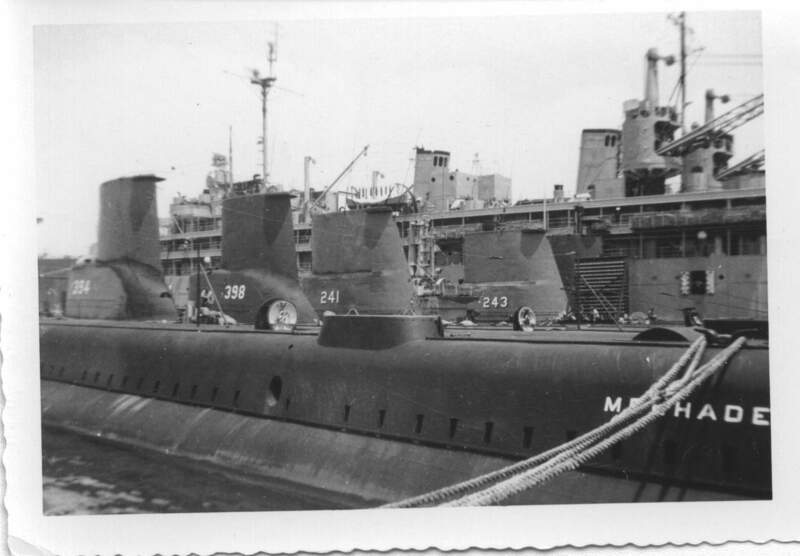 Two of the submarines behind the Redfish are either the Razorback (SS-394), Ronquil (SS-396) & Scabbardfish (SS-397). All 4 boats were launched that day. USN photo courtesy of ussubvetsofwwii.org. 178k Miss Ruth Roper holds the bottle at the Christening ceremony aboard the Redfish (SS-395) at Portsmouth Navy Yard, Kittery, ME., 27 January 1944. 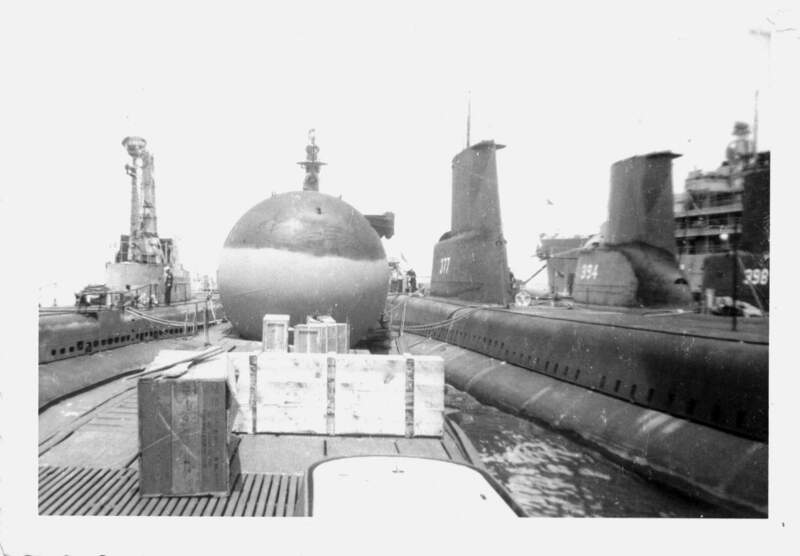 Two of the submarines behind the Redfish are either the Razorback (SS-394), Ronquil (SS-396) & Scabbardfish (SS-397). All 4 boats were launched that day. USN photo courtesy of ussubvetsofwwii.org. 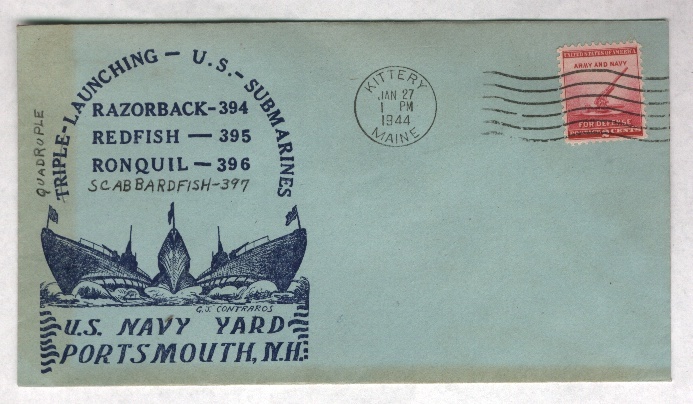 123k Commemorative postal cover marking the quadruple launching of the Razorback (SS-394), Redfish (SS-395), Ronquil (SS-396) & Scabbardfish (SS-397) launching, 27 January 1944 at Portsmouth Navy Yard, Kittery, ME. Courtesy of Jack Treutle (of blessed memory). 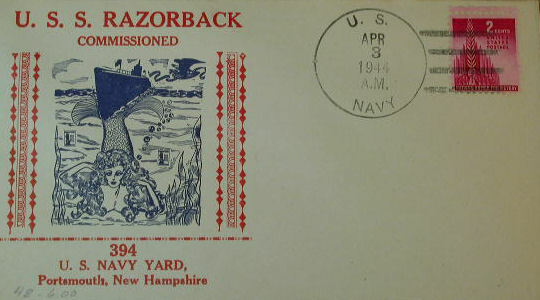 41k Commemorative postal cover marking the Razorback's (SS-394) commissioning, 3 April 1944. Courtesy of Jack Treutle (of blessed memory). 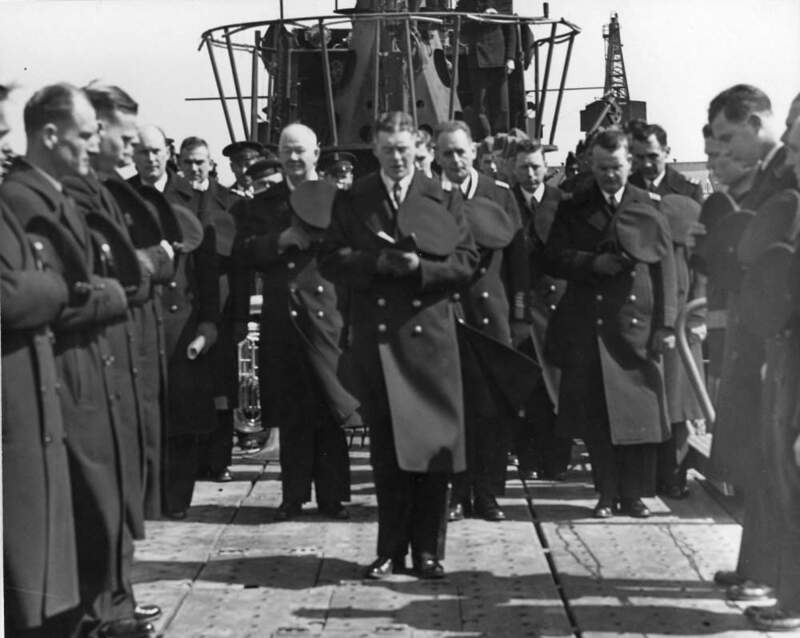 175k RADM Thomas Withers, USN, addressing officers and crew of the Razorback (SS-394) during her commissioning ceremony on 3 April 1944. US National Archives Photograph # 2216867 courtesy of Bill Gonyo. 217k LCDR. 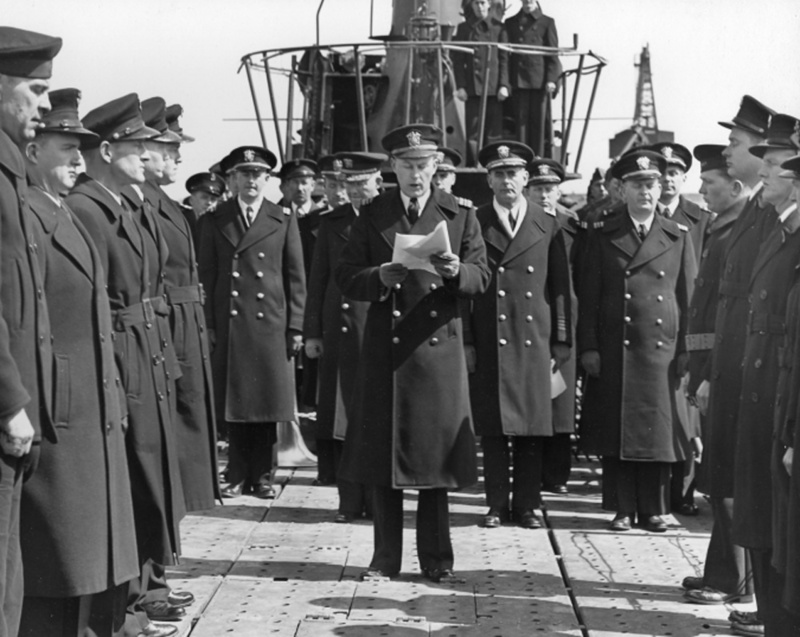 Albert W. Bontier, reading orders of taking command of the Razorback (SS-394) during her commissioning ceremony on 3 April 1944. US National Archives Photograph # 2216869 courtesy of Bill Gonyo. 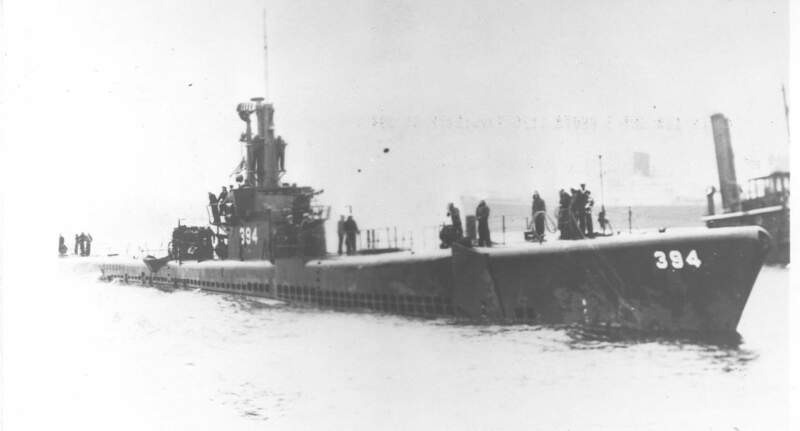 276k Officers of Razorback (SS-394). 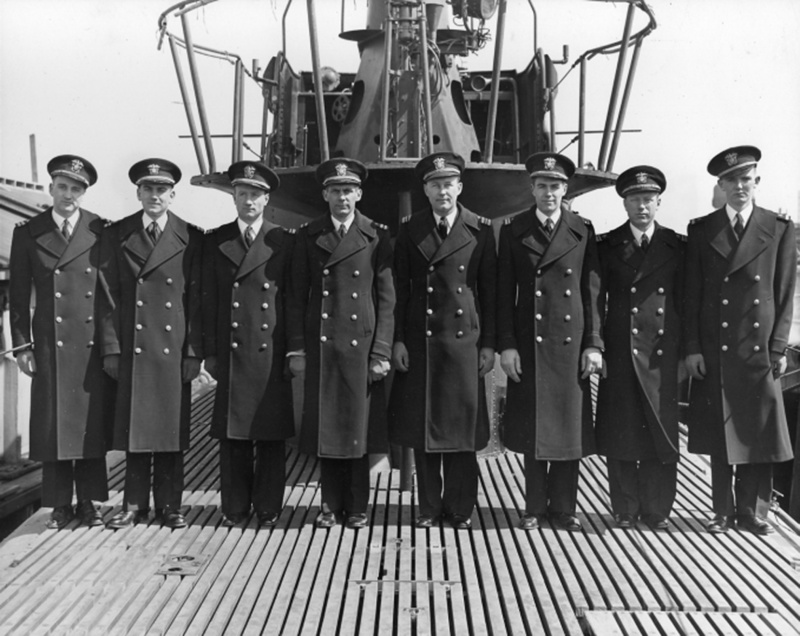 L-R - LT R. L. Smith, USNR; LT R. S. Thompson, USNR; LT(jg) J. H. King, USN(T); LT J. L. Haines, USN; LCDR A. M. Bontier, USN, Commanding Officer; LT(jg) A. R. Hersh, Jr., USN; LT(jg) L. B. Crann, USNR; ENS L. T. Adains, USNR" during her commissioning ceremony on 3 April 1944. US National Archives Photograph # 2216872 courtesy of Bill Gonyo. 167k An undated picture of the Wakatake - class destroyer HIJMS Kuretake underway, location unknown. 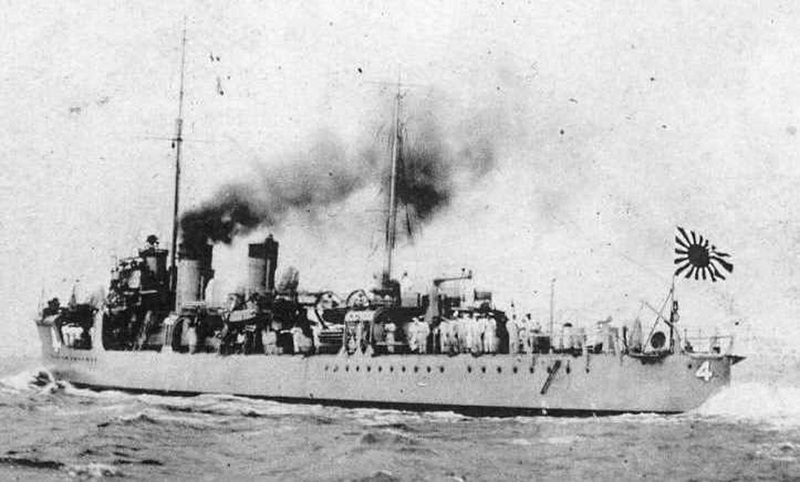 Kuretake was torpedoed and sunk by the submarine Razorback (SS-394) on 30 December 1944, 65 m SE of Formosa (21 degrees N, 121 degrees 24' E). Imperial Japanese Navy official photo. via Robert Hurst. 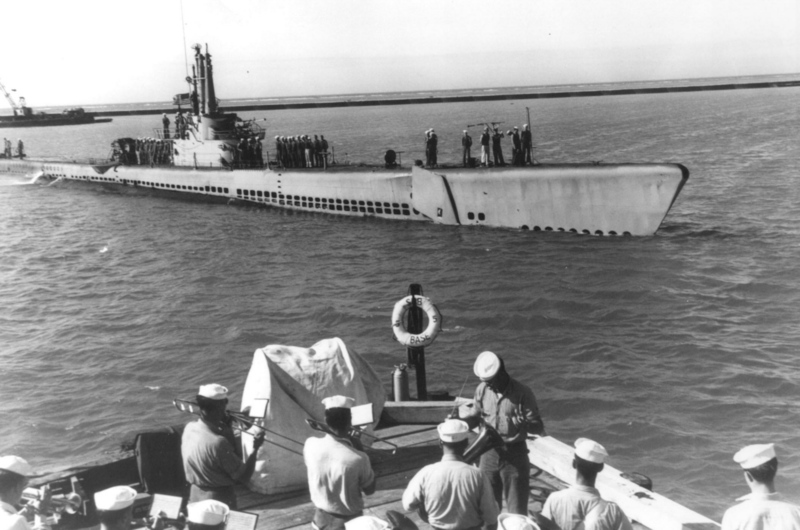 Razorback (SS-394) is serenaded as she comes into Midway on 27 June 1945. Photo courtesy of Scott Koen & ussnewyork.com. 1.17k Officers and crew on the bridge of the Razorback (SS-394) as she enters Midway on 27 June 1945. USN photo courtesy of usssubvetsofwwii.org. 1.04k Officers and crew line the deck of the Razorback (SS-394) as she enters Midway on 27 June 1945. USN photo courtesy of usssubvetsofwwii.org. 95k Proteus (AS-19) with submarines of Submarine Squadron 20 alongside in Tokyo Bay, on VJ-Day, 2 September 1945. 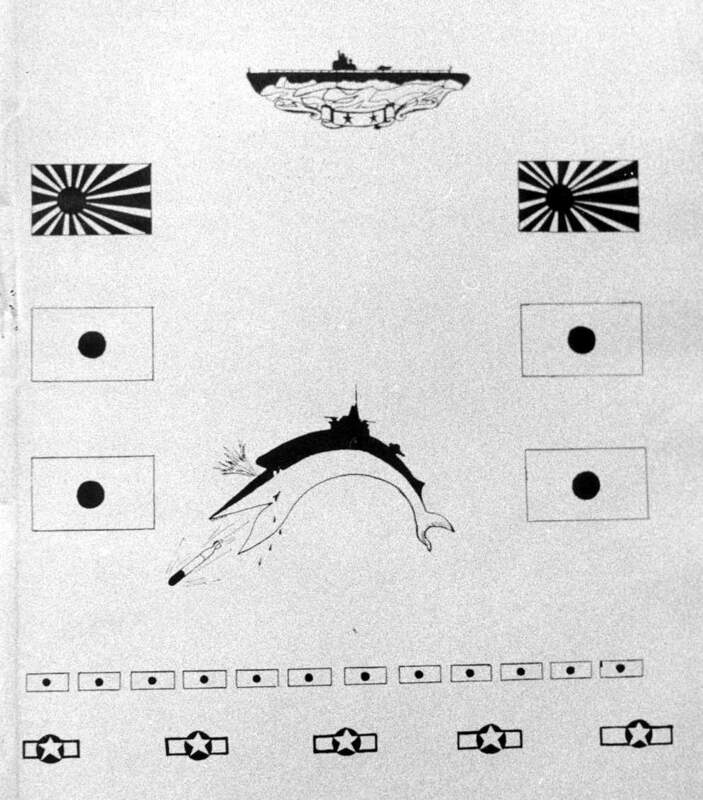 Names of the submarines present, their commanding officers and the commanding officers of SubRon20 and Proteus are printed at the bottom of the image: Archerfish (SS-311), Cavalla (SS-244), Gato (SS-212), Haddo (SS-255), Muskallunge (SS-262), Pilotfish (SS-386), Razorback (SS-394), Runner (SS-476), Segundo (SS-398), Sea Cat (SS-399), and Tigrone (SS-419). USN photo # NH 95019, from the collections of the US Naval Historical Center. Courtesy of Captain Joseph F. Enright, USN(Retired), 1979. 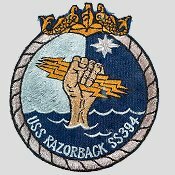 50k WW II battle-flag of the Razorback (SS-394), 16 merchant vessels, 2 men of war, 5 American airmen rescued. USN photo courtesy of usssubvetsofwwii.org. 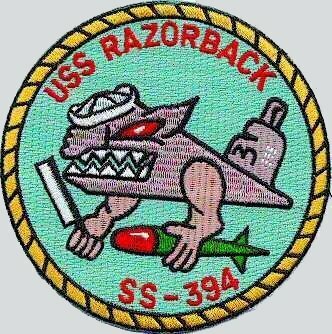 2.61k Twenty nine page PDF history and War Patrols of the Razorback (SS-394). Photo courtesy of Scott Koen & ussnewyork.com. 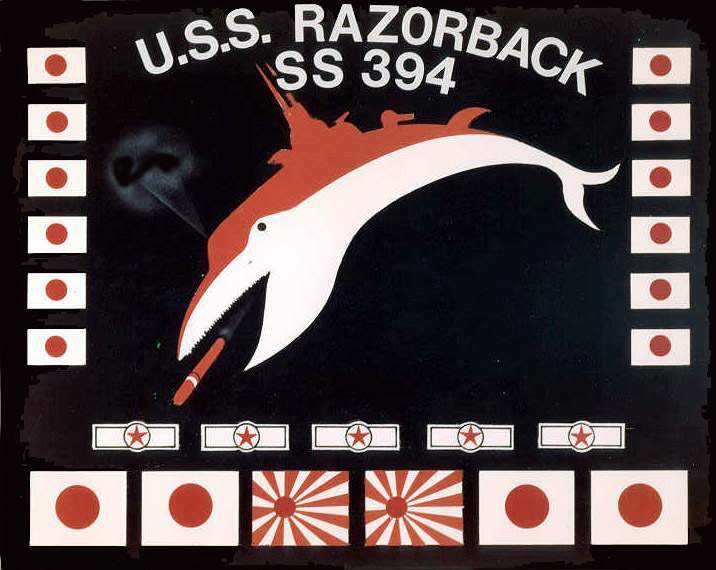 159k WW II battle-flag of the Razorback (SS-394), 16 merchant vessels, 2 men of war, 5 American airmen rescued. USN photo courtesy of usssubvetsofwwii.org. 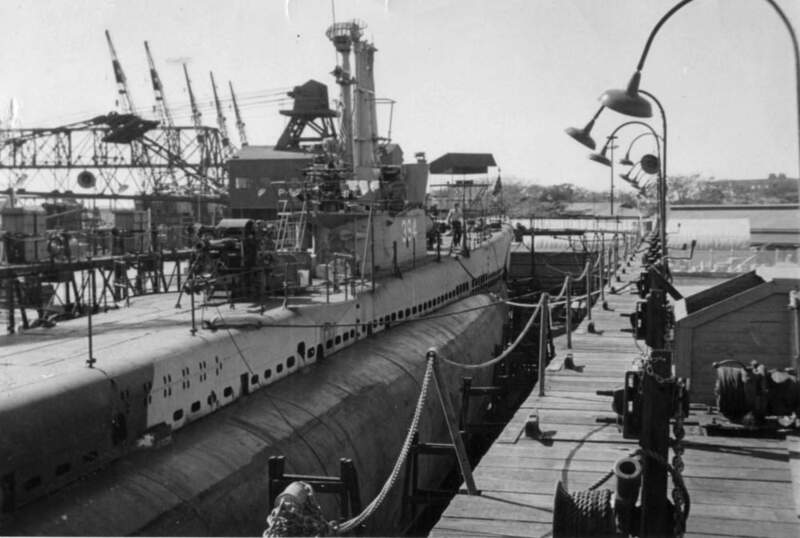 69k Razorback (SS-394) in drydock, Pear Harbor, HI in 1946-47. Starboard side view from aft looking forward. Taken from the edge of the drydock. Photo courtesy of aimm.museum. (Arkansas Inland Maritime Museum at North Little Rock).From the Clarence Huffman collection. 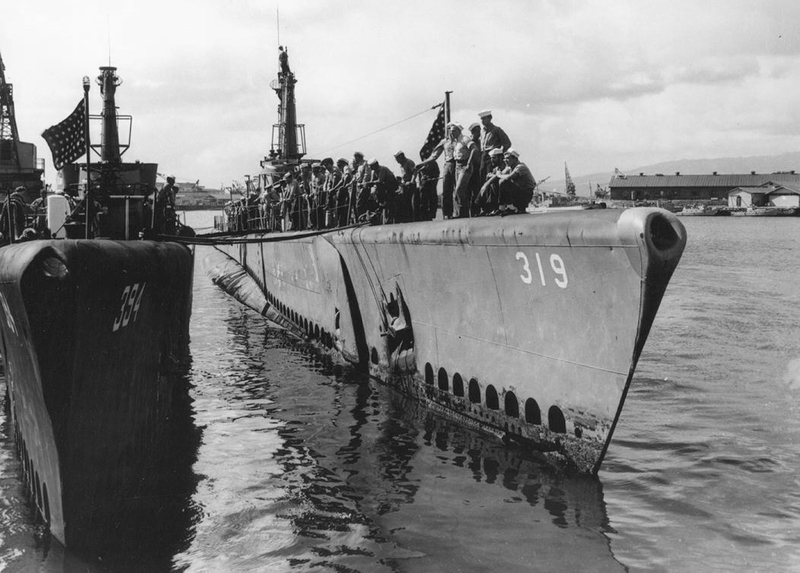 682k Becuna (SS-319) & Razorback (SS-394) at Pearl Harbor, circa 1946. USN photo courtesy of usssubvetsofwwii.org. 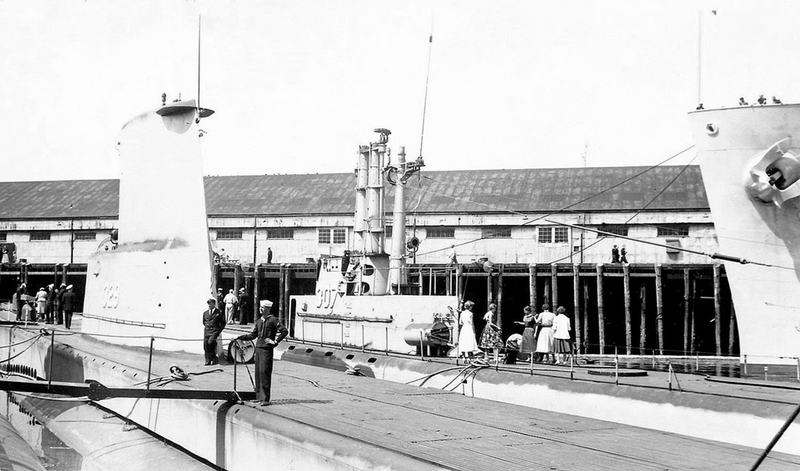 656k Razorback (SS-394) pierside, circa 1946. Photo courtesy of Scott Koen & ussnewyork.com. 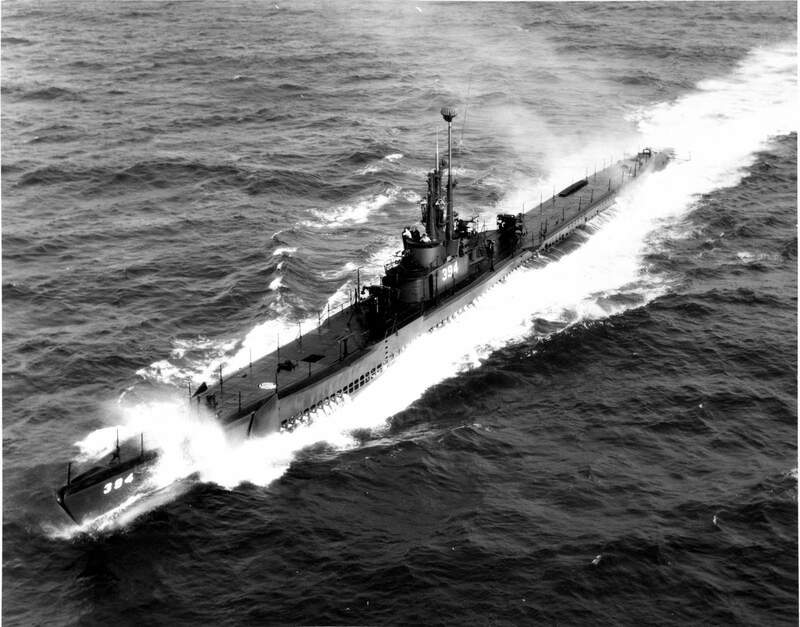 319k Aerial photograph of Razorback (SS-394) underway. This shot, taken from broad on the starboard bow, is an excellent view of her late-war and immediate post-war configuration, with both deck guns still in place. USN photo & text courtesy of aimm.museum. (Arkansas Inland Maritime Museum) from the Gene Haley Collection via Bill Gonyo. 565k Razorback (SS-394), same description as above photo. Photo courtesy of Scott Koen & ussnewyork.com. 512k Gunless Razorback (SS-394). Photo courtesy of Scott Koen & ussnewyork.com. 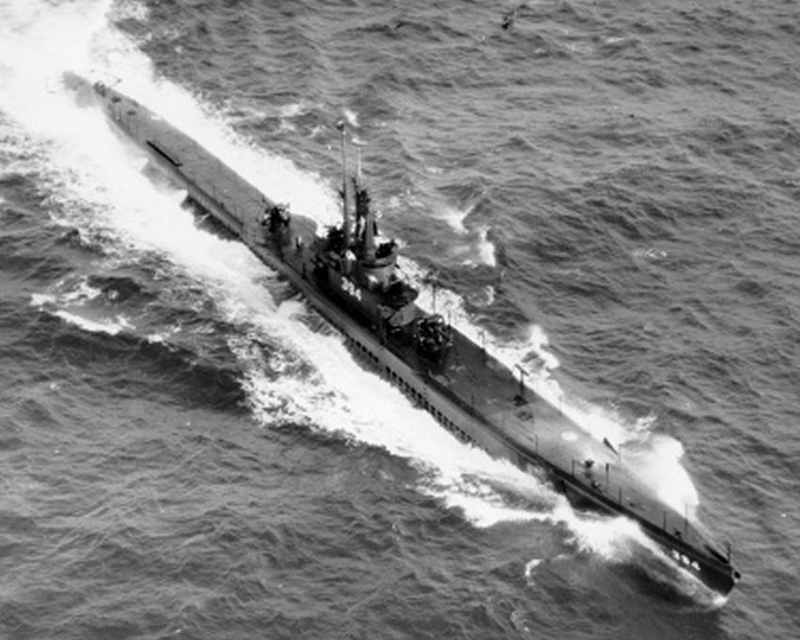 70k Escorted by a tugboat, Razorback (SS-394) moves along sometime after 1946. Her bow 5" inch gun has been removed. USN photo courtesy of David Buell. 615k Razorback (SS-394) next to the HMCS Antigonish (K-661), circa 14 June 1947. Photo i.d. courtesy of Aryeh Wetherhorn. Photo # AM1506-S3-3-: CVA 447-7731 courtesy of Walter E. Frost via searcharchives.vancouver.ca courtesy of John Hummel, USN (Retired). 95k Razorback's (SS-394) bow, taken from the forward cigarette deck. The towing bullnose is clearly visible, as is the JT sonar on the port side. The foundation for the forward gun is just out of sight, below the bottom edge of the photograph. USN photo & text courtesy of aimm.museum. (Arkansas Inland Maritime Museum) from the Gene Haley Collection via Bill Gonyo. 166k The After Engine Room hatch has a square fairing. 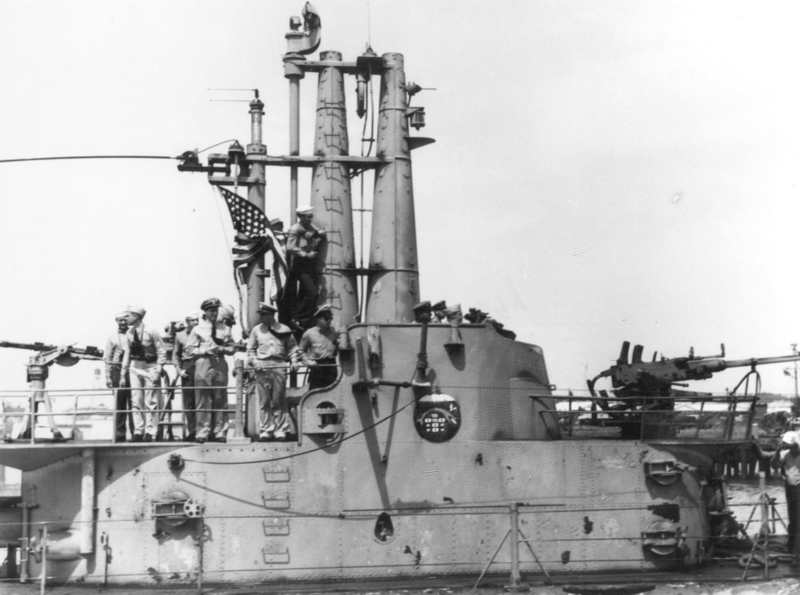 The after 5-inch gun and the deck modifications to accomodate it are clearly visible, as are the guards around the propellers. USN photo & text courtesy of aimm.museum. (Arkansas Inland Maritime Museum) from the Gene Haley Collection via Bill Gonyo. 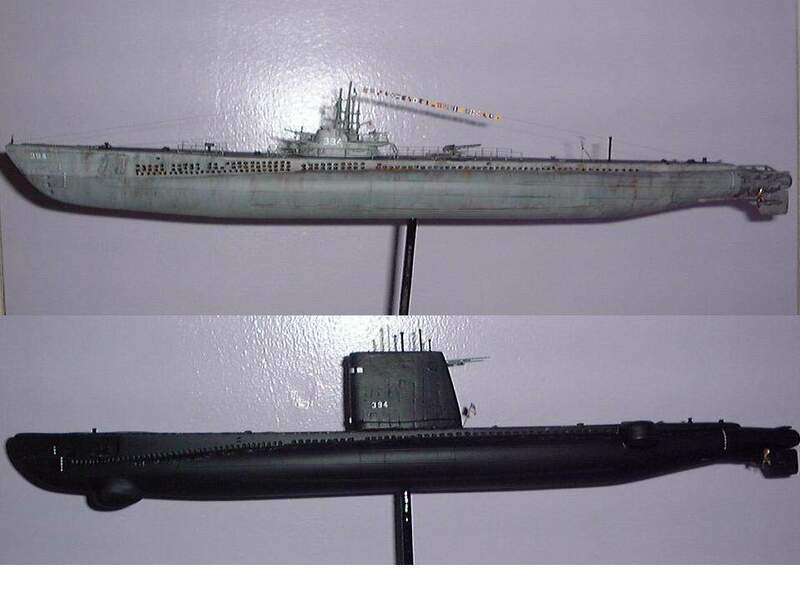 53k WWII and GUPPY configurations of the Razorback (SS-394). Courtesy of Philip LaVoie. 283k Captain Leonce Arnold LaJaunie, Jr. was the Commanding Officer of Razorback (SS-394) from July 1946 to August 1948. USN photo & text courtesy of aimm.museum. (Arkansas Inland Maritime Museum) from the Gene Haley Collection via Bill Gonyo. 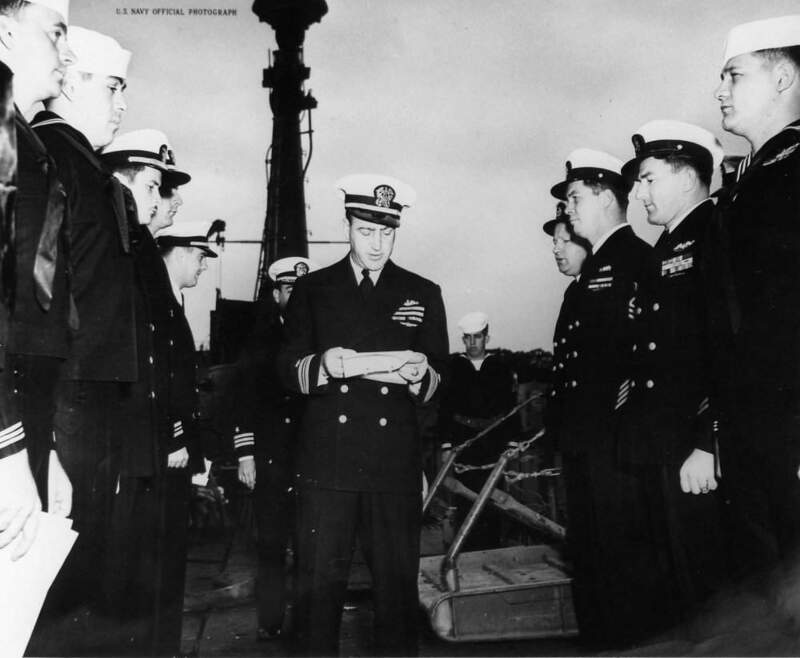 57k The new Commanding Officer of Razorback (SS-394), LCDR R. J. Jones, reads his orders at Mare Island on 2 June 1950 during change of command ceremonies. USN photo # 6331-6-50, courtesy of Darryl L. Baker. 210k Fulton (AS-11) at the state pier New London, CT in March 1953. Submarines present include Entemedor (SS-340), Halfbeak (SS-352), Angler (SS-240), Razorback (SS-394), Tusk (SS-426), and Hardhead (SS-365). SS P&T Leader is across the pier. USNHC photograph # NH-905254 courtesy of aimm.museum. (Arkansas Inland Maritime Museum at North Little Rock). Courtesy of CAPT Joseph A. Enright, USN (Retired). 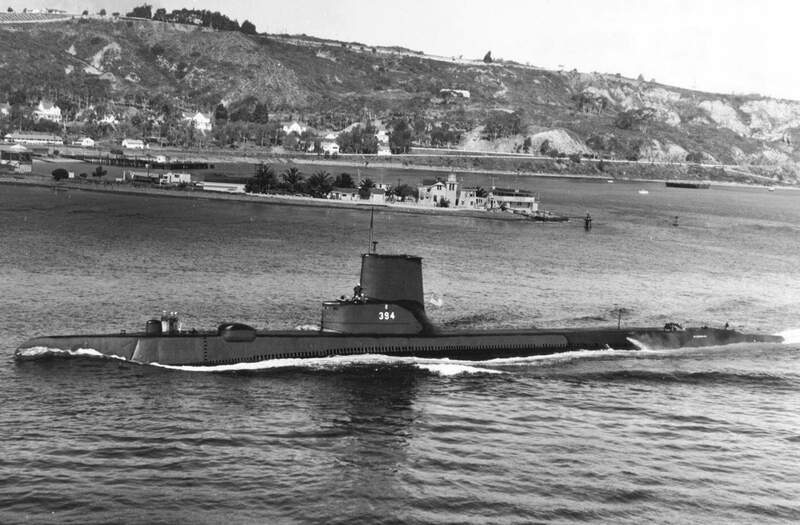 111k Bashaw (SSK-241), with Bream (SSK-243),Segundo (SS-398), Razorback (SS-394), and Menhaden (SS-377),in San Diego Harbor, circa 1953. Courtesy of Phil Gulick, former 1st Amphib Recon Company member aboard the Perch (SS-313). 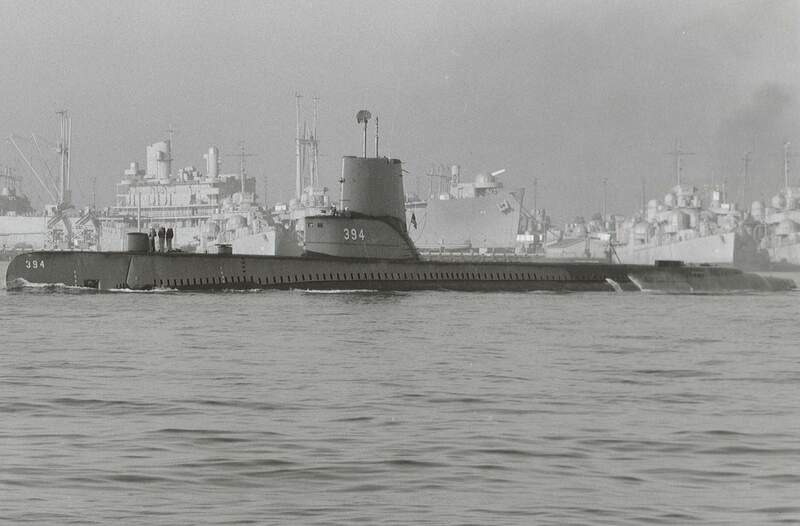 99k Segundo (SS-398), Razorback (SS-394), and Menhaden (SS-377), in San Diego Harbor, circa 1953. 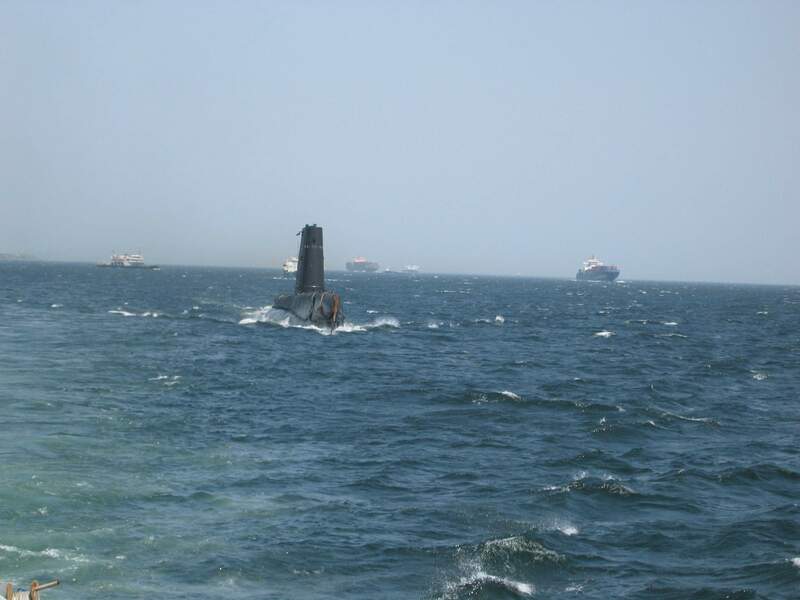 Courtesy of Phil Gulick, former 1st Amphib Recon Company member aboard the Perch (SS-313). 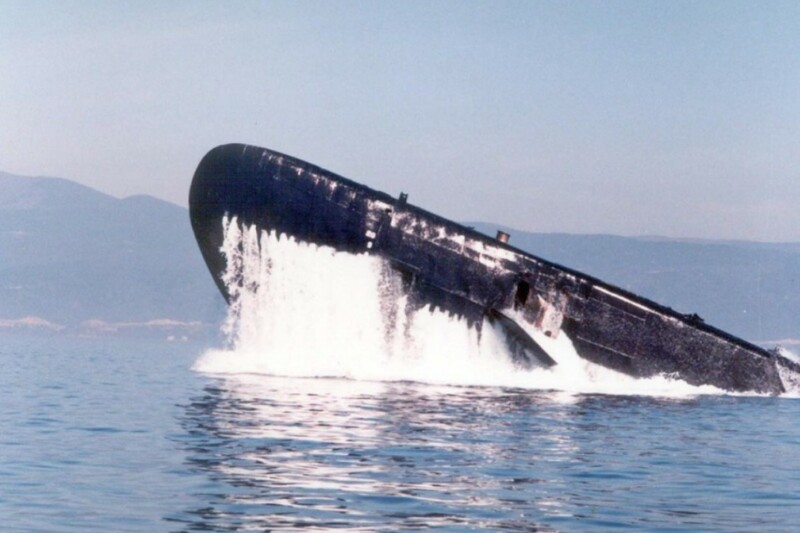 142k This photo and the next two are post overhaul sea trials (she would be recommissioned on 01 June 1954). She sports the "step sail" that she would retain until 1962, and she has the distinctive rounded "GUPPY" bow and snorkel. 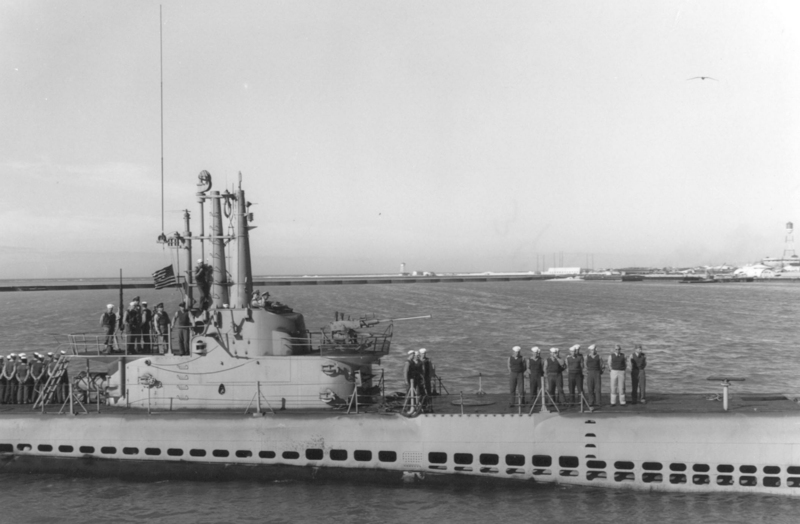 Starboard view of the Razorback (SS-394), late January 1954. USN photo courtesy of usssubvetsofwwii.org. Text courtesy of aimm.museum. (Arkansas Inland Maritime Museum at North Little Rock). 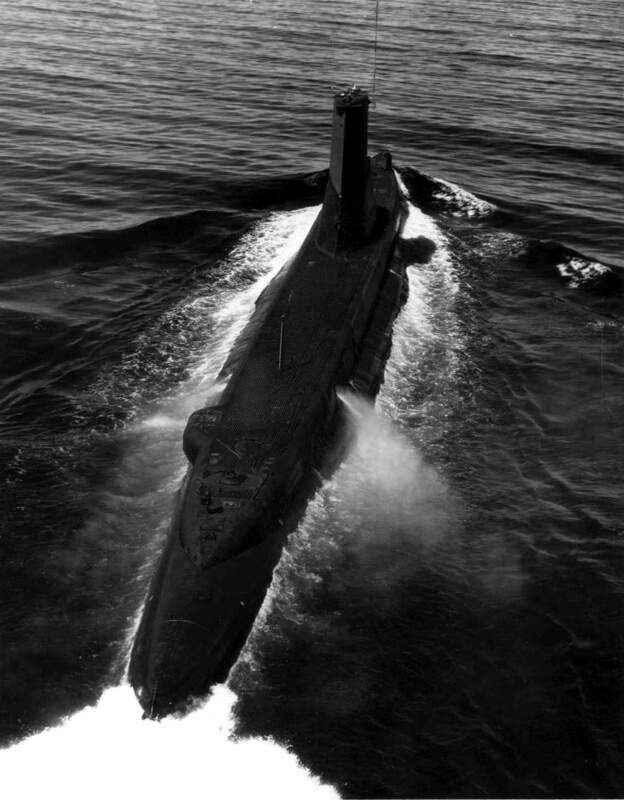 166k Stern view of the Razorback (SS-394) late January 1954. USN photo courtesy of usssubvetsofwwii.org. 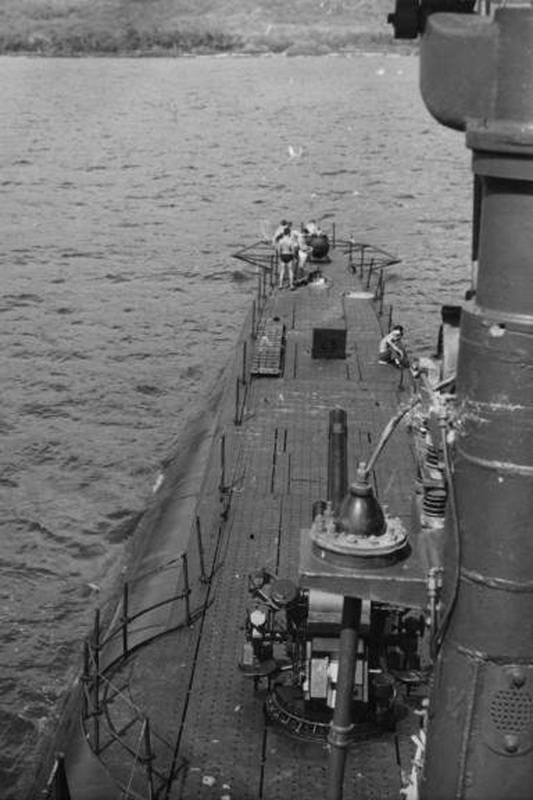 105k Bow view of the Razorback (SS-394) late January 1954. USN photo courtesy of usssubvetsofwwii.org. 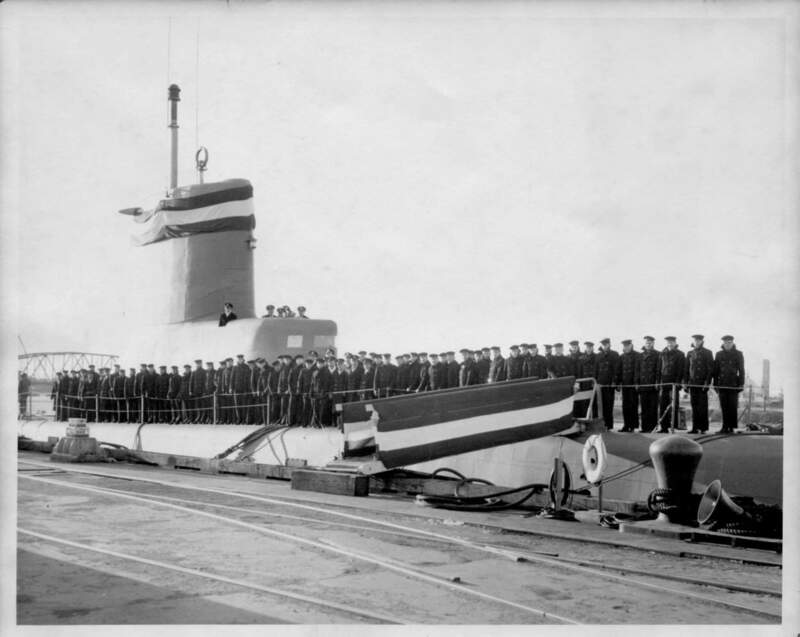 88k Razorback (SS-394) at her Recommissioning ceremony, 8 January 1954 at the Portsmouth Naval Shipyard. 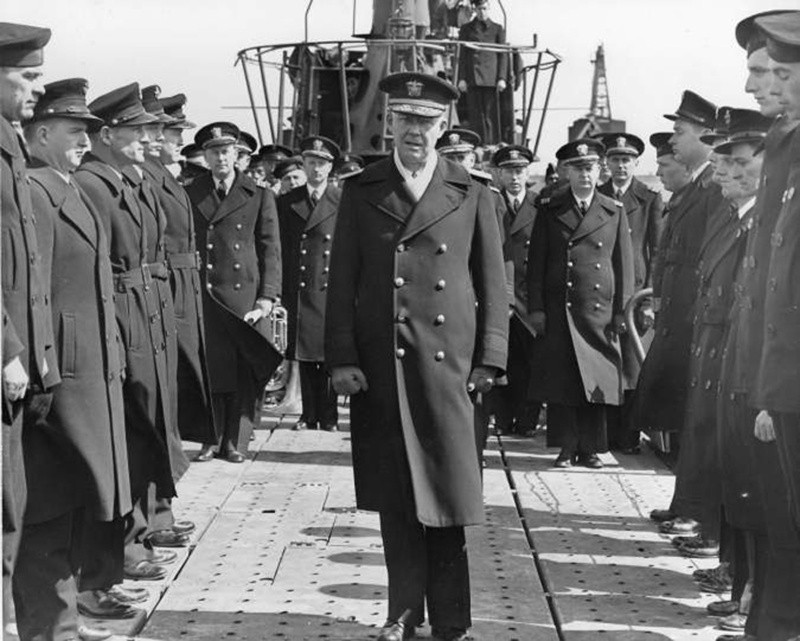 LCDR Charles E. Stastny was her Commanding Officer upon recommissioning. USNHC photograph # NH-905254 courtesy of aimm.museum. (Arkansas Inland Maritime Museum at North Little Rock). 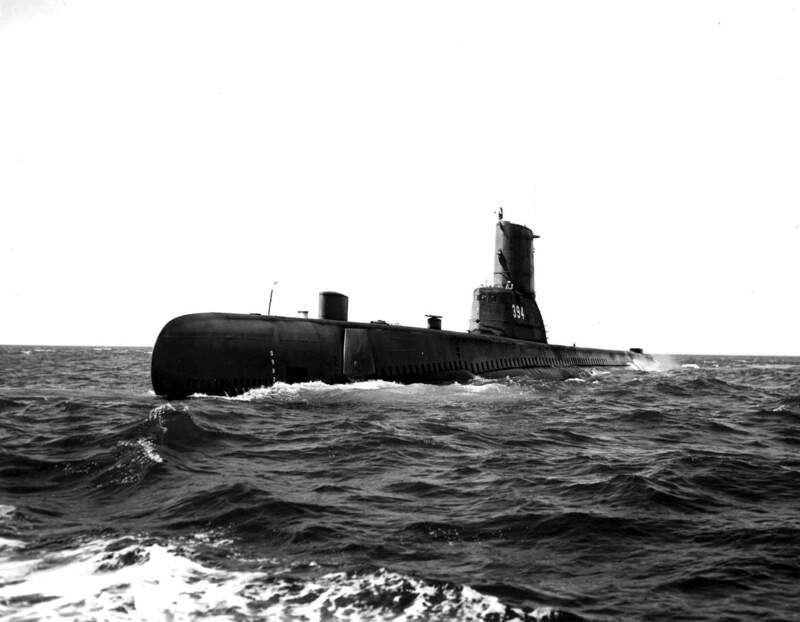 581k Northern bound Razorback (SS-394), circa 7 August 1956. Photo # AM1506-S3-3-: CVA 447-8707 courtesy of Walter E. Frost via searcharchives.vancouver.ca courtesy of John Hummel, USN (Retired). 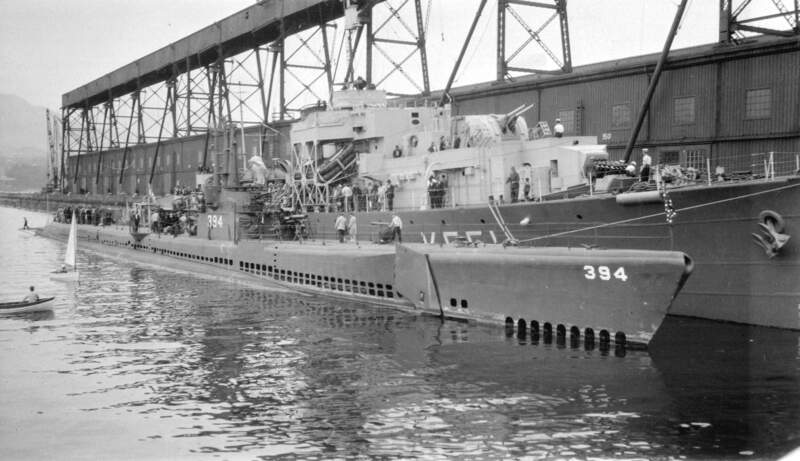 533k Tilefish (SS-307),Charr (SS-328) & Razorback (SS-394) visit Vancouver, Canada in 1957. Photo taken by Gordon Hunter, from Namaino, BC, Canada via wikimedia.org courtesy of Robert Hurst. 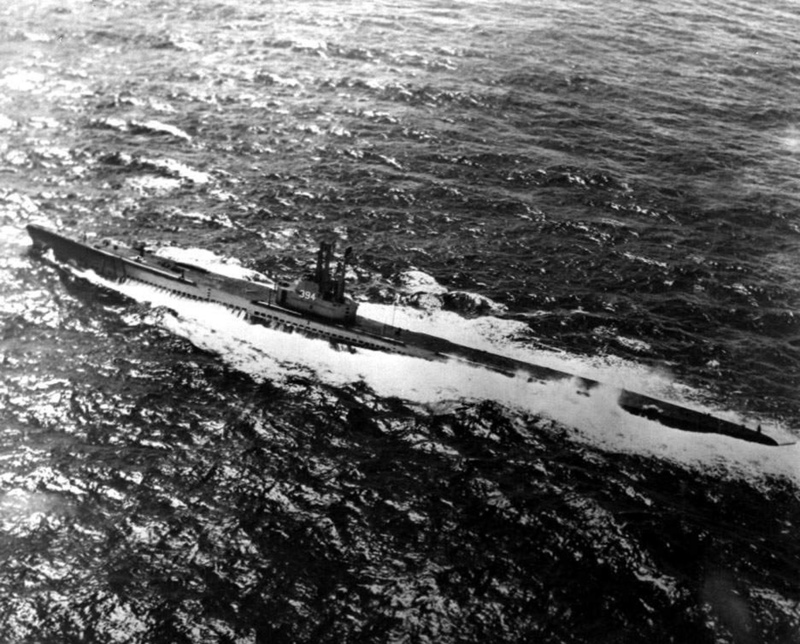 266k The Razorback (SS-394) conducting ASW operations with the Bennington CVS-20 on 28 June 1960. The photo was produced by the Bennington photo lab. Official USN photo # CVS-20 1886(L), courtesy of Robert M. Cieri. 2.23k Razorback (SS-394) passes by the mothball fleet (somewhere), circa 1961. Photo courtesy of Scott Koen & ussnewyork.com. 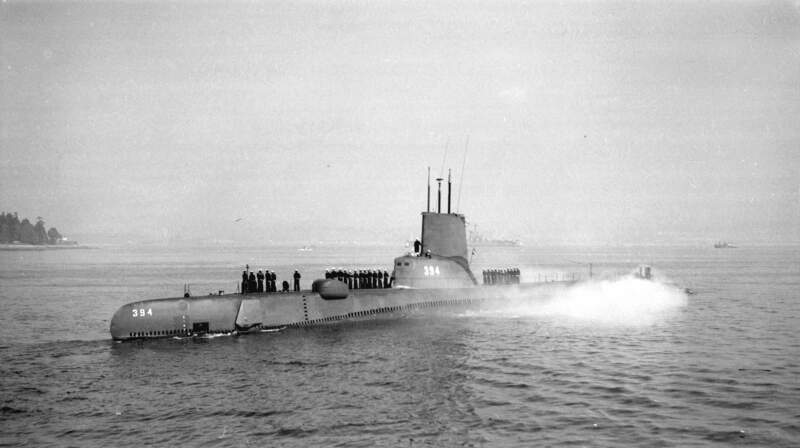 1.13k Razorback (SS-394) in early 1961. Photo courtesy of Scott Koen & ussnewyork.com. 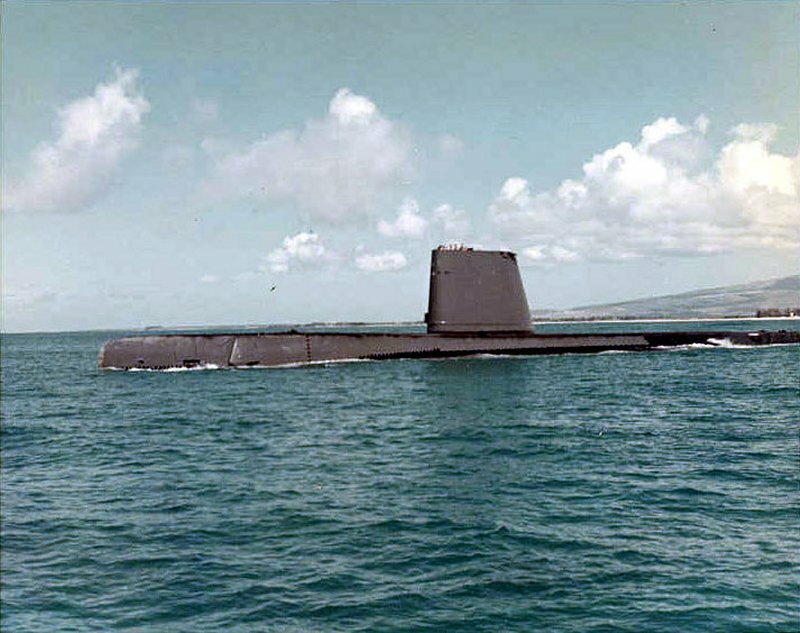 210k Razorback (SS-394) operating off the coast of Oahu, HI., 10 March 1961 has not yet entered the shipyard for her final modifications. 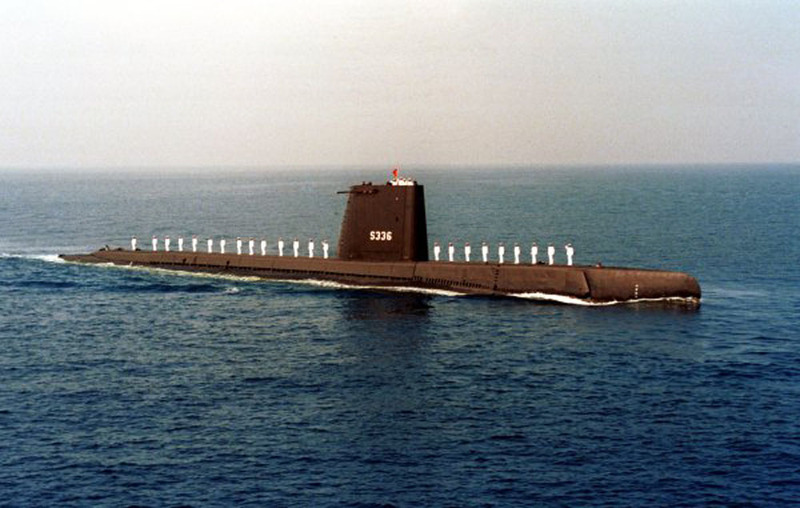 She still has the "step sail" that was installed in 1952 as well as the large sonar domes on deck. USNHC photograph # USN 201053572, by PHC R.A. Carlisle, courtesy of aimm.museum. (Arkansas Inland Maritime Museum at North Little Rock). 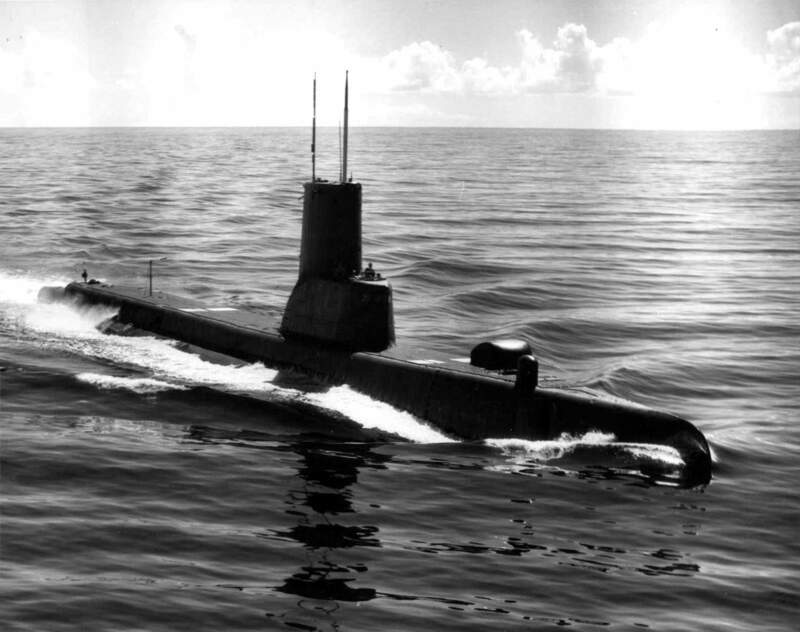 113k Port side view of the Razorback (SS-394) after GUPPY IIA conversion, circa 1960's off Hawaii. USN photo courtesy of usssubvetsofwwii.org. 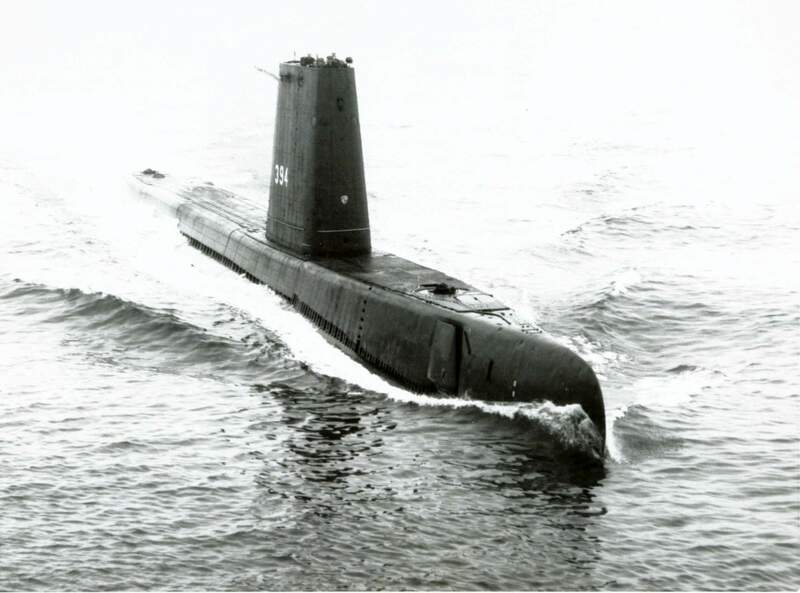 202k Razorback (SS-394) appears here in a File Photo from 17 August 1964. USN photo # N-0000P-001 by Photographer's Mate 1st Class J.B. Paul, courtesy of news.navy.mil. 664k Razorback (SS-394) by the riverside. Photo courtesy of Scott Koen & ussnewyork.com. 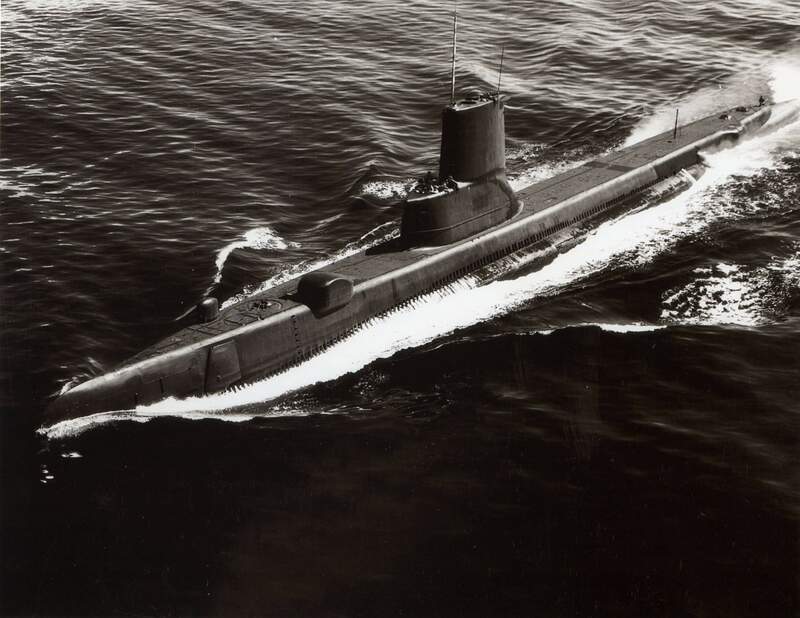 815k Ten page Welcome Aboard PDF of the Razorback (SS-394), circa 1968. Photo courtesy of Scott Koen & ussnewyork.com. 92k The ex-Razorback (SS-394) as the Muratreis (S-336) is the second boat on the left, middle boat is the Cerbe (S-340), ex-Trutta (SS-421), the ex-Sea Fox (SS-402) as the Burak Reis (S-335) (2nd from right), with other Turkish subs; one of which is the ex-Tang (SS-563) as the Pirireis (S-343) and the other as ex-Gudgeon (SSAG-567), now the Hizirreis (S-342). Photo courtesy of Y.M.Umar,CPO (Ret. ),Turkish Navy. 116k The Muratreis (S-336) with crew in dress whites pose for a group photo. Photo courtesy of Y.M.Umar,CPO (Ret. ),Turkish Navy. 98k The Muratreis (S-336) glides against the backdrop of the mountains. Photo courtesy of Y.M.Umar,CPO (Ret. ),Turkish Navy. 136k The bow of the Muratreis (S-336), rises above all else. Photo courtesy of Y.M.Umar,CPO (Ret. ),Turkish Navy. 114k The Muratreis (S-336) waiting to go to voyage USA, 22 November 2002. Photo courtesy of Sait Kucuk, CPOS (Retired),Turkish Navy. 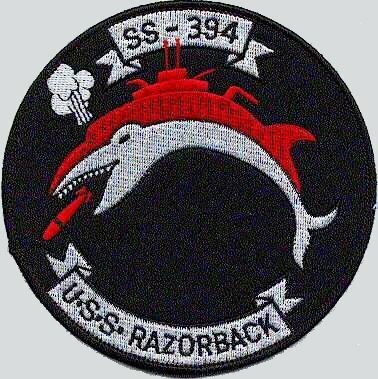 346k Razorback (SS-394), is heading home. Courtesy Naval Affairs Journal, January 2003. 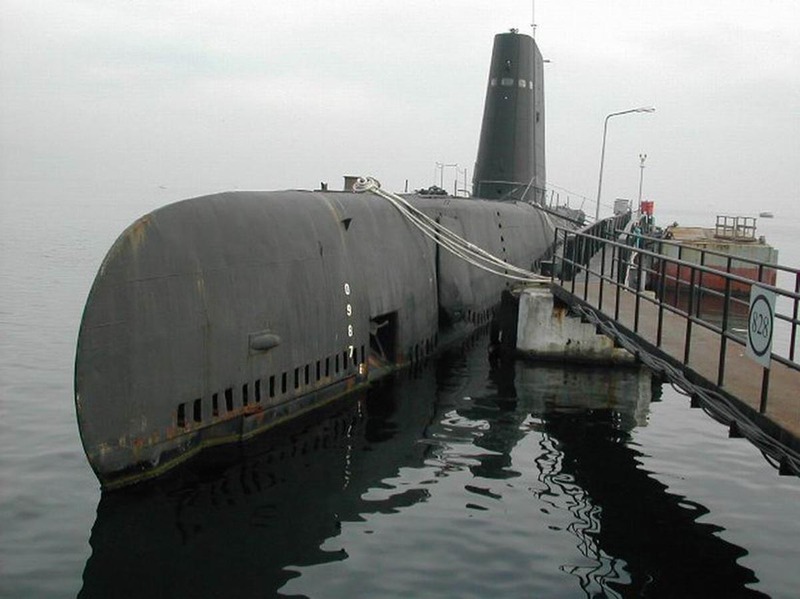 87k Possible ticket to the decommissioning ceremony of the Muratreis (S-336), 24 March 2004. Photo courtesy of Y.M.Umar,CPO (Ret. ),Turkish Navy. 166k Members of the Press show their credentials for the transfer ceremony, 25 March 2004. 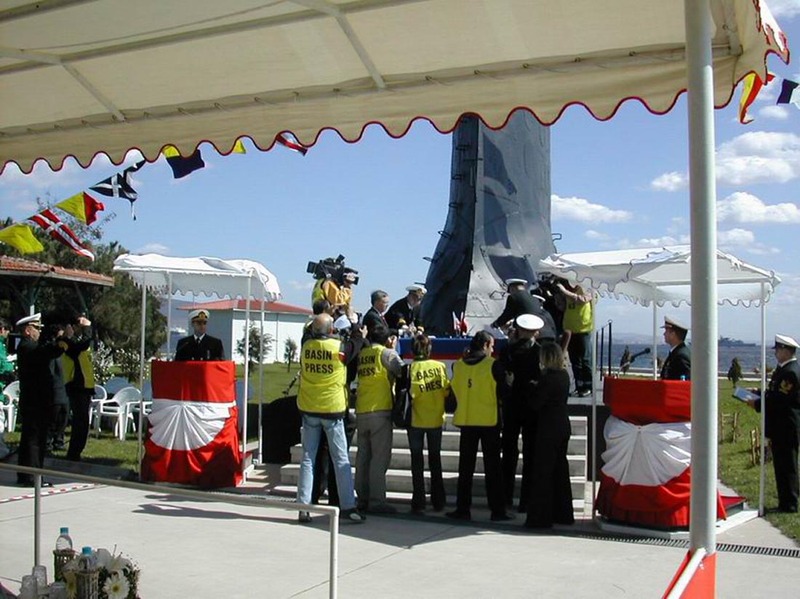 The sail of the ex- Cerbe (S-340) is in the background. Photo courtesy of Sait Kucuk, CPOS (Retired),Turkish Navy. 191k And the band played on. Photo courtesy of Sait Kucuk, CPOS (Retired),Turkish Navy. 168k The star of the day shines through a partly cloudy sky. Photo courtesy of Sait Kucuk, CPOS (Retired),Turkish Navy. 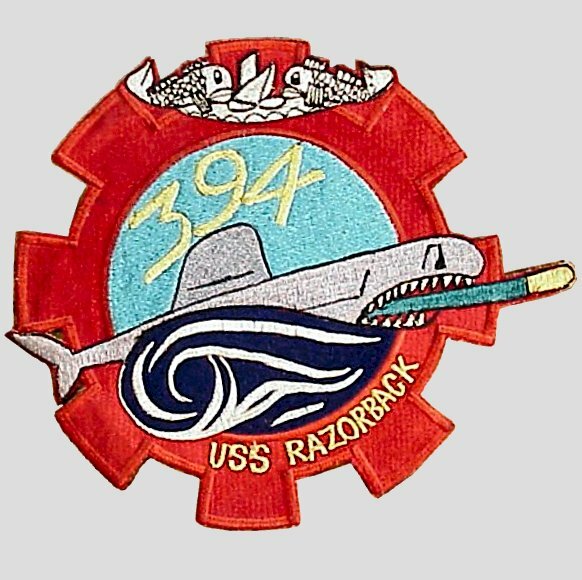 247k Razorback (SS-394) undertow during her journey from Istanbul, Turkey to North Little Rock, Arkansas. Photo submitted by John Hummel, courtesy northlr.org/maritime-museum. 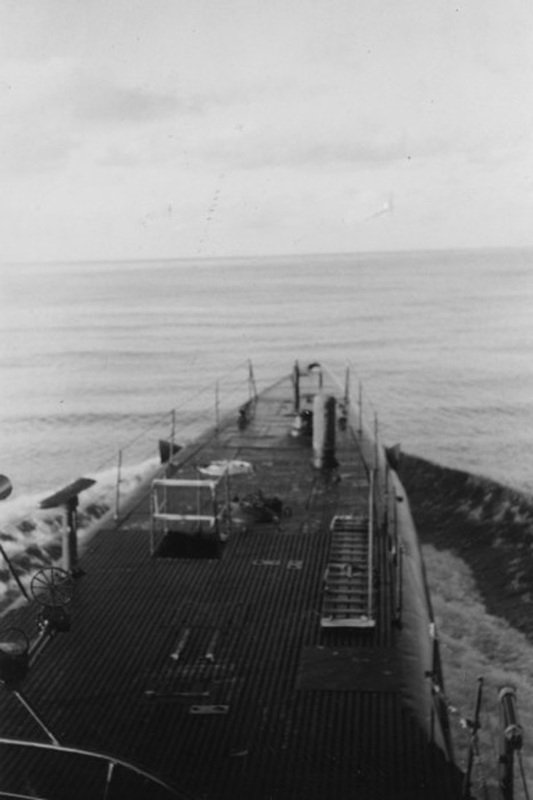 129k Starboard view of the Razorback (SS-394), undertow during her journey from Istanbul, Turkey to North Little Rock, Arkansas. Photo submitted by John Hummel, courtesy northlr.org/maritime-museum. 113k Wearing a red ribbon and escorted by a helicopter, this last operational WWII submarine is being brought to North Little Rock, Ark., by a group of submarine veterans and local authorities to serve as a museum. Partial text courtesy of news.navy.mil. 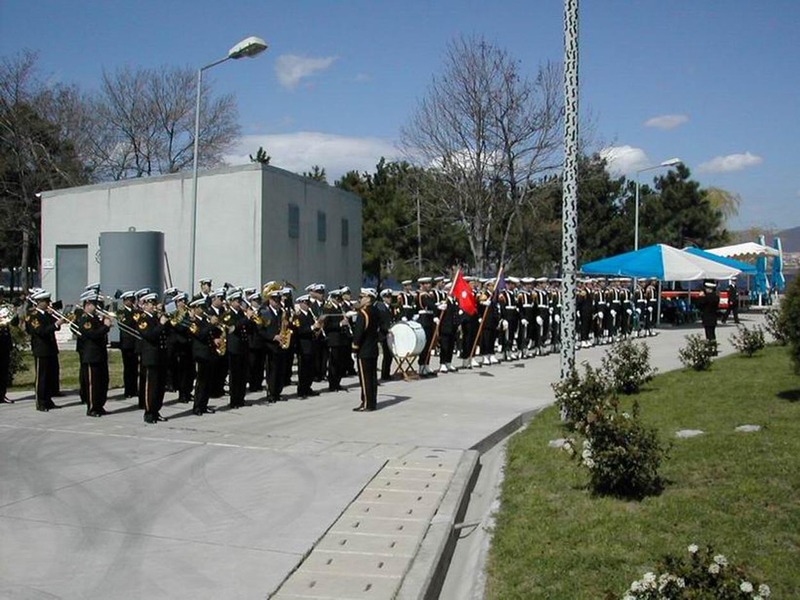 Photo courtesy of Sait Kucuk, CPOS (Retired),Turkish Navy. 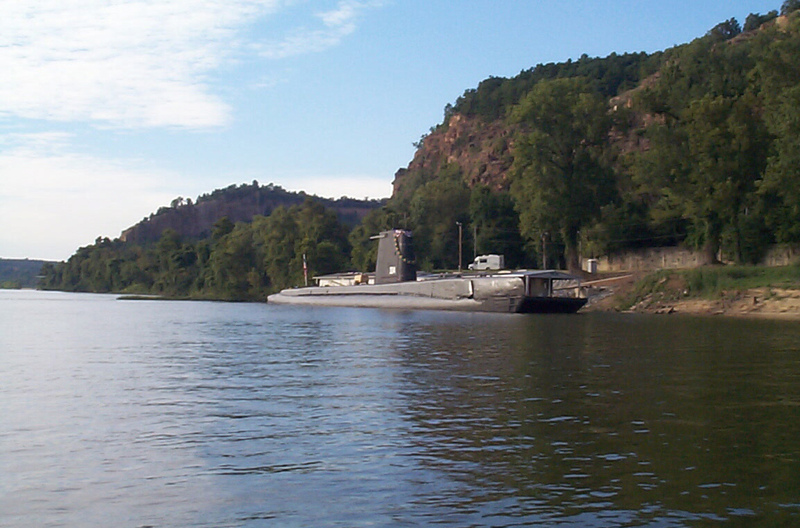 273k Entering the home stretch, Razorback (SS-394) on 3 August 2004 at the David D. Terry lock and dam just southeast of Little Rock, Arkansas. Photo submitted by Chris Hogan. 105k Assisted by a tug nudging her towards the dock, the Razorback (SS-394), proceeds to tie up. Photo submitted by John Hummel, courtesy northlr.org/maritime-museum. 59k Razorback (SS-394), tieing up to wharf. Photo submitted by John Hummel, courtesy northlr.org/maritime-museum. 243k From the Pensacola News Journal - Monday, June 14, 2004. 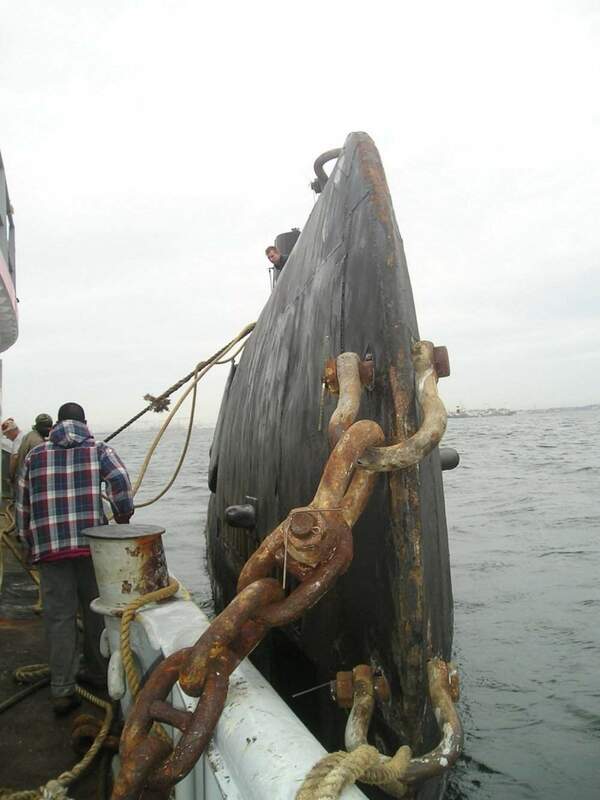 "World War II submarine making stops along coast." Associated Press KEY WEST -Navy veterans and local dignitaries celebrated the arrival of a World War II-era submarine as the Razorback (SS-394) made its first U.S. stop in the Florida Keys on Sunday en route to its new home on the banks of the Arkansas River. 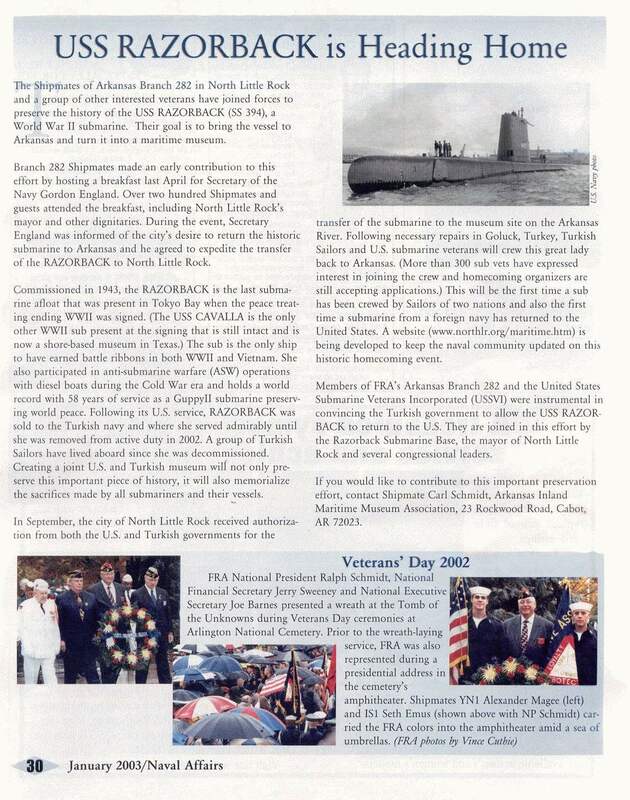 The city of North Little Rock, Ark., acquired the submarine from Turkey in March after the Turkish Navy, which purchased the sub from U.S. Navy in 1970, decommissioned it. John Ranguette of Fort Myers served on the Razorback from 1960 to 1962 and was on hand at Key West to welcome her home. "She looks beat up, but she sure looks beautiful to us," Ranguette said after touring the Razorback . "She has some rust and so forth, but I know that will be taken care of. The Razorback will be towed into the Gulf of Mexico today and is scheduled to arrive in New Orleans on Saturday. 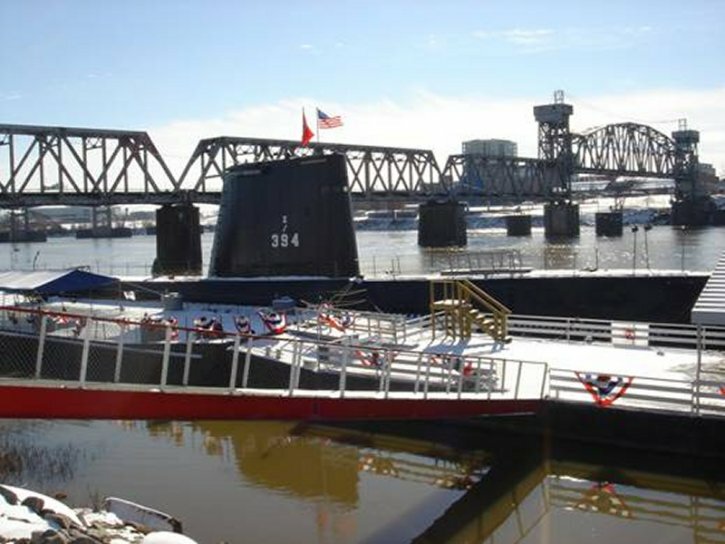 The submarine should arrive at its permanent home in North Little Rock in late July where it will become a tourist attraction as part of a inland maritime museum. 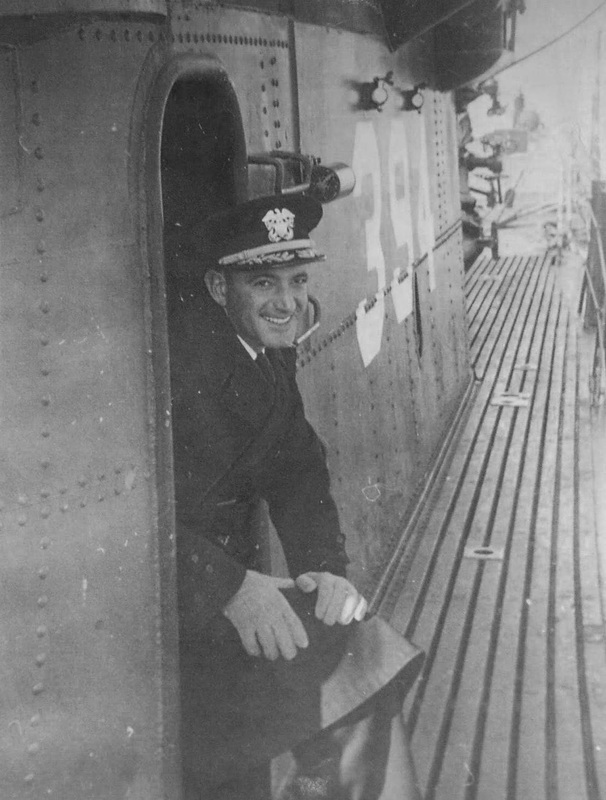 Gene Haley, who served on the Razorback from 1945 to 1948, planned to accompany the ship. The former quartermaster from Ogunquit, Maine, will serve as navigator during the Razorback final sea voyage. North Little Rock Mayor Patrick Hays joked about his expanding job responsibilities brought by the submarine. "I never felt like bringing a submarine from Turkey would be part of my job description," he said. Hays also plans to attend celebrations marking the Razorback 's arrival in New Orleans. Photo & text courtesy of Joe Radigan. 70k A chilly day in Arkansas. Razorback (SS-394) with a light dusting of the Christmas snow, 2004. Submitted by Joe Radigan. Photo & text courtesy of (CNLR Mayor's Office).